K4 recently underwent a website redesign. The new website has been live since December 1st and we hope that you like it! The pressure was on, being designers, to not just design something beautiful and functional but to design a website that was built and poised for successful Internet marketing. Today’s website has two audiences – readers AND search engines and unfortunately the two have very different and distinct tastes. So our new goal was to create a visually appealing, user friendly and engaging website for the visitors, while at the same time making it search engine friendly; ultimately satisfying the needs and wants of both audiences. Also, multiple versions of the new website were needed – traditional, mobile and tablet. A question that needs to be considered at the very beginning of a website redesign is, “Why don’t we show up when you Google our services?” There are many things that can be done inexpensively and in-house to solve this problem. All the search engines rank sites automatically using an “algorithm,” which is nothing more than a big collection of computer code that calculates where you should rank compared to your competition based on a number of factors. Search engine optimization (SEO) is the process of affecting the visibility of a website in a search engine’s “natural” or unpaid (organic) search results. To understand the basics of SEO, watch this short video. There are many SEO best practices that can be done on-site, meaning on your own website, including the following. Keywords – make sure the keywords that people would type into Google (or any other search engine) to find you actually appear in your website. Keywords should be in page titles, website copy, photo captions, etc. That being said – don’t overdo it. It’s obvious to search engines what you are doing and frowned upon, plus it makes your copy really repetitive and a little weird for your other audience, your readers. Offer well-written content that paints a clear picture of your services and you satisfy both the search engines and people looking to do business with you. 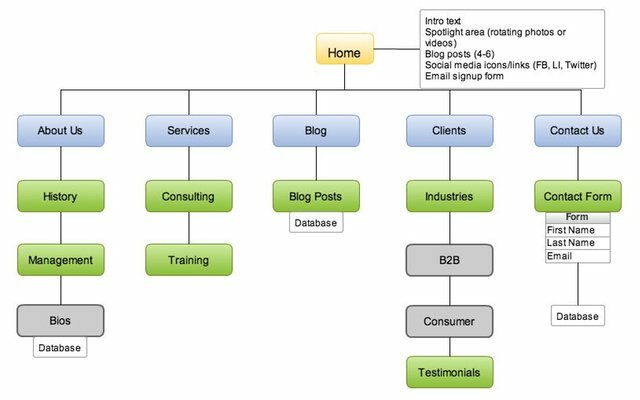 Sitemap – make sure to include a sitemap, WordPress has a good plugin. It makes the job for the search engines a bit easier because you’re telling them exactly what your website includes, where it is at, and how the items relate to each other. Got rid of flash! It’s not compatible with Apple products & won’t show up on the iPad or iPhone. Post your videos on Youtube & link to them. Instead of rotating photos with flash, use jQuery rotators. Blog! Search engines like regularly updated websites and a blog allows you to do just that. Plus it positions you (and any other writers in your organization) as experts in your field. Also, it’s searchable content. It allows you to show for keywords in the search engines that aren’t strictly services you offer, but on topics pertaining to your industry. Blogging gives an avenue for outreach efforts to gain links back to our website. You can pitch a blog post, or a guest posting opportunity to any company or organization that would find what you are writing about useful. Their website might have a lot more traffic than yours; exposing your company to a larger audience you may not have had the chance to reach otherwise. We used a WordPress blog and incorporated it into its own page on our website, installing the wordpress files on our server. Backlinks – Backlinks are the single most important ranking factor. Think about links as “votes” for your website. When the search engines find a bunch of “votes” for your website from other websites, they assume your website must be relevant and deserves to rank higher than the rest. So instead of relying on the content of the website itself to determine where that site should rank, the search engines would rely on other websites to determine where it should rank, basically creating a referral system for determining rankings. The sites with the most quality links rank the highest. Think about other companies that you have relationships with (clients, organizations, etc.) and form a strategy on those that you will ask to link to you. Be specific on where you want the link; don’t contact them without first looking at their website and determining where a link to you would make sense and why. Social Media – Marketing has shifted from a one-way broadcast to a multi-point conversation and the new “word of mouth” is online social media like Facebook, LinkedIn, Pinterest and Twitter. People are using social media as search engines and asking others for recommendations. If your competition, current clients and prospects are on social media, it is time to take the plunge. Integrate your social media and form a strategy for each. K4 uses Facebook to communicate what we’re up to. The LinkedIn goal is the same as Facebook but for the strictly business arena. Pinterest is what we like. We combine these social media channels with our blog, which communicates what we think. I personally find it very difficult to manage more than three social media channels, so be selective in what you will participate in; being honest about how much time you can devote to effectively managing and updating your channels. A final plus, social media links back to your website & drives traffic! The alignment of your website, social media and SEO strategy boosts the impact of your Internet Marketing campaign & allows you to control your online presence. Managing how you appear online is like managing your reputation. Putting more content out there that you control equals free advertising that drives traffic to your website. A website redesign is the perfect opportunity to put the pieces in place to set your company up for successful Internet marketing.